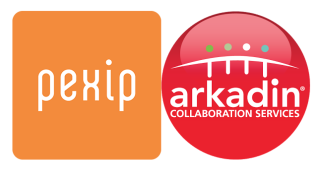 Arkadin, an NTT Communications company and provider of cloud-hosted unified communications and collaboration (UC&C) solutions, and Pexip have formed a strategic partnership that will enable Arkadin's customers to enjoy more engaging and successful meeting experiences. Pexip's Infinity meeting platform ties together enterprise communication tools such as Microsoft Skype for Business, audio and web conferencing, and legacy video conferencing solutions, providing customers with simpler deployments and unmatched simplicity, flexibility, and scalability. The aim of the partnership is to allow Arkadin's customers to achieve greater workplace efficiencies that will lead to cost savings and a higher return on their UC&C investments. "We are extremely pleased to announce this strategic partnership with Arkadin, considered by most to be the worldwide leader in cloud-hosted UC&C solutions," said Åsmund O. Fodstad, Pexip CEO. "Our Infinity platform is developed with the enterprise in mind—large organizations that demand predictability, large scale, and interoperability between their existing collaboration platforms and the new wave of UC solutions. Arkadin is the perfect partner to provide this to the world's leading enterprises." "Seamless interoperability between collaboration technologies is what customers want," said Thomas Valantin, Arkadin's chief commercial officer. "The combination of Pexip's innovative platform with Arkadin's sophisticated global UC&C architecture and global support capabilities, raises the bar giving customers the highest quality meeting experience available anywhere today."